When I finally arrived on Delmar Boulevard (affectionately referred to as “The Loop” by St. Louisans) on Sunday night, the energy was ridiculous in the best of ways. Everyone was chatting animatedly, and I didn’t meet a single unkind person. (Seriously, it could have been a backyard BBQ, that’s how chill the vibe was.) A few young women shared their defining moments from this election with me while we waited for the debate to start. Meanwhile, volunteers and viewers of all ages, ethnicities, genders, and sexual orientations were gathered in front of The Pageant, happily waiting for the doors to open. When those doors eventually did open, things got even better. The Pageant was packed so tight (with mostly millennials, no less) that I barely found a seat. A massive projector screen streamed CNN coverage of the debate — and even though the watch party was free to attend, every viewer was gifted a complimentary drink ticket and access to all the deep dish pizza they could handle. Shortly after the debate began, the already-high energy of the place skyrocketed when an older gentleman proudly yelled, “Get him, Hill!” And on top of all that, the venue’s lighting was more indicative of a rock show than the second presidential debate. Understandably, everyone seemed to be digging it. As you can imagine, the whole night was awesome — but listening to Hillary supporters share defining moments from this election cycle was by far the best part. Here’s what they told me. "My standout moment in this election cycle was at the Democratic National Convention, when Bernie Sanders gave his support to Hillary Clinton. I was frustrated because I was a Sanders supporter — but seeing his support for Hillary, plus Hillary's ultra-positivity in the face of all these obstacles that came later on, really solidified how I was going to vote. I am voting for Hillary Clinton." "My standout moment was when Hillary Clinton went in on Donald Trump about his views on women and women's rights, and the fact that women don't get paid as much as men, and the fact that women's healthcare is more expensive than men's." "For me, a really important moment was at the vice presidential debate, when they actually talked about abortion and religion, and how that's going to play into the candidate's time in the White House. That was really important to me, because sometimes it's kind of pushed under the rug, and it's a really important issue." "I'm actually from India, and I'm doing a road trip through the United States. I've been following the election pretty closely because I'm a huge West Wing fan, and so obviously, anything election-related is right up my alley. What really stood out for me in this election was I think capped off by the video that came out on Friday. It just showed how terribly the Republican party has sunk, and I feel really bad for people who have to support someone who had these thoughts. But on a more positive side, what really impacted me about this debate was the last question, when they were both asked to say really positive things about each other. I really admire that Mr. Trump called Mrs. Clinton a fighter and not a quitter, because I think that's an attitude that all of us could do with." "For me, a defining moment was when Trump said that Rosie O'Donnell deserved everything that she got. I think that victim-blaming is a big problem in our community, and in the world in general." "I think the defining moment for me really was at the first debate. Listening to both candidates, you know, really lay out their plans and their thoughts on everything. 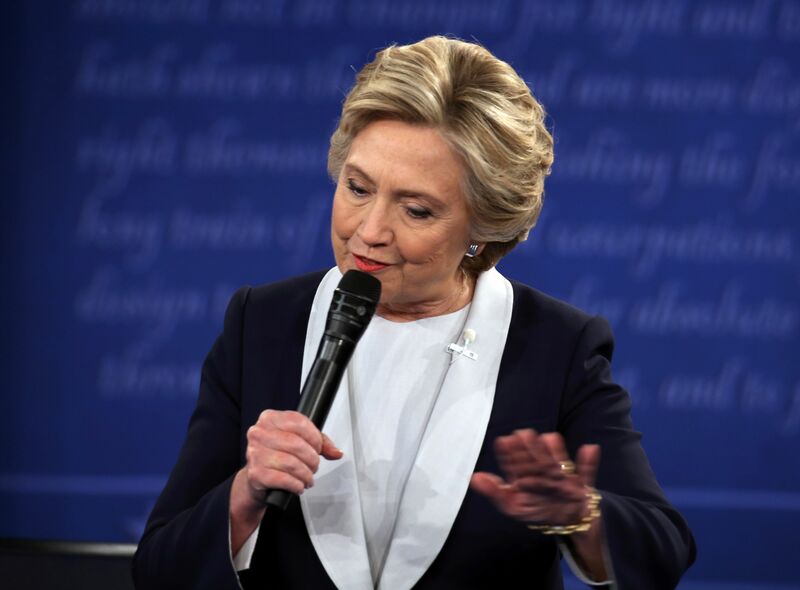 I think the way Donald Trump handled himself was misogynistic and rude, and I really like the way Hillary stood up for herself and handled herself — and kind of let Donald interrupt himself and embarrass himself." "The standout moment for me was when Trump was finally actually going to be the Republican presidential nominee. I thought, 'This is actually going to happen. We're actually going to have Donald Trump on the ticket. He's actually going to be running.'" "The standout moment for me was definitely during the primaries, when Donald Trump referred to Megyn Kelly and said that she was on her period, 'bleeding out from wherever,' and that's what influenced her questions. [Editor's note: The exact quote Trump used was "blood coming out of her wherever," and his campaign later claimed he was referring to Kelly's nose.] It was right then that several of my friends and family immediately were like, 'This is not happening.' Any support for him that I had seen was gone." "The standout moment for me was in the first debate, when Trump defended his comments on Rosie O'Donnell, saying, 'She deserved it.'" "The most outstanding part for me — part one is any single time anyone asks Trump a question, he doesn't go straight ahead and answer the question. Instead, he decides to somehow find a way to attack Hillary. Another thing about it is, you know, the new release of videos with the lewd comments about women. Most of his supporters think that most men talk that way, like that's an acceptable form of how gentleman should talk about women." "My biggest standout moment, I guess, is the fact that Donald Trump does not address his questions very well. He deflects them and turns onto other topics, where he does actually end up attacking Hillary Clinton a lot of the time. [It's] just the fact that he can't even answer a simple question with an honest answer. [It's] also that he does see a lot of women as objects, and that there are so many people in America that support his views on this. That's really disturbing to me." "The defining moment for me was when Hillary became the Democratic nominee, because it really signaled that issues that Bernie potentially was going to bring up needed to be called out by the public even more. Hillary has not been addressing them. And obviously, Trump has not at all. It seems that we need to really move our attention back to the issues that matter to the majority of people in the U.S."
"The defining moment for me was at the Democratic National Convention, where I heard the Mothers of the Movement speak, and saw that Hillary was truly committed to those who are facing racial inequity on a day-to-day basis. It really hit home for me, because I was actually friends with Sandra Bland — we went to college together. So to see someone who I identify with — and her mom — have a platform to elevate the inequities that her daughter suffered and that are going on for so many people of color, really let me know that Hillary gets it — and that she is committed to all of us moving forward together. Young people, people of color, women, and everyone in this country. "